Restricted Registration will open Saturday, January 9, 2016 at 10 am. 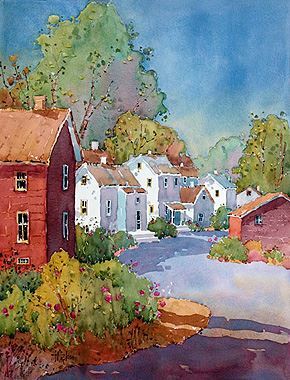 The Baltimore Watercolor Society is pleased and excited to host acclaimed watercolorist, Joyce Hicks, AWS, in a four-day watercolor workshop where she will introduce BWS watercolorists to her painting style and techniques. The workshop will begin Tuesday, June 7 and continue through Friday, June 10, 2016 at the Hawthorn Center in Columbia, MD. Joyce will be the juror for the 2016 Mid-Atlantic Watercolor Exhibition, and will also present an evening program (to be announced later) during her week in Maryland. 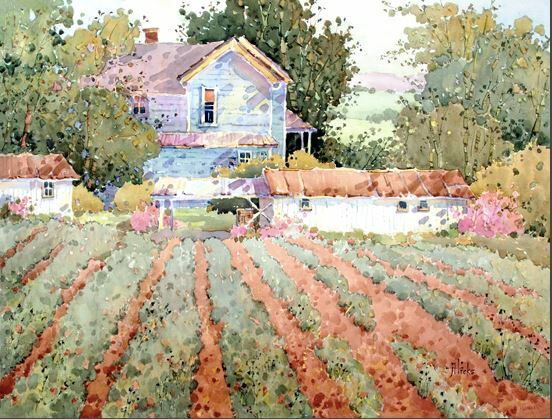 Joyce will introduce her students to her unique style and her process of painting the landscape in watercolor. The workshop emphasis is on techniques and strategies for transforming ordinary scenes into extraordinary ones with watercolor; scenes that reach out and connect with viewers. Joyce teaches simple easy to learn methods that appeal to beginners as well as seasoned artists looking for renewed inspiration and insights into new ways of thinking. Students learn from clear explanations about the reasoning behind artistic decisions and visually from step-by-step demonstrations. Students learn to distill and process scenes from inspiration to finished work of art becoming more comfortable with the medium in the process. Joyce says, "Once technical aspects of watercolor have been mastered you too will begin to paint from that sacred place that resides within each of us. I bring my passion and love for teaching to inspire and motivate in a fun, fast-paced workshop." The class will include a combination of lectures and painting demonstrations by Joyce, plus student painting time with coaching and critique by the instructor. I’ve always been able to see places and things in an idealistic way, but it wasn’t until I discovered painting that I was able to express and interpret this personal view. My art is not always a true rendition of what is actually there but how I wish it could be. If the old white homestead is a bit neglected, then I will just capture it in sunlight to discover its real beauty. If there is only one withered rose on the old trellis then why not one hundred in full bloom? Frequent travel allows me to see and define what my heart is drawn to. Not in the grand or extraordinary but in simple unassuming beauty. Painting gives me the opportunity to unite visual images with a montage of personal memories stored over a life time. In an attempt to translate my feelings for a subject I use interesting brush strokes, strong contrasts, sunlight and shadow in colors both soft and bold. These elements combine in a personal way providing a visual invitation to tempt others into my world. My purpose is to uplift the human spirit and my hope is that my paintings will inspire others to join me as I continue my artistic journey. I enjoy entering competitions, teaching workshops and presenting painting demonstrations. The price for the workshop is $425 for BWS members (Signature Artists and Associates) and $500 for non-BWS members. This workshop with Joyce Hicks is a "restricted" workshop, meaning that if you register for this workshop you will not be able to also register for either the Joyce Hicks or Iain Stewart workshops. Paid registrants who cancel before March 15, 2016 will receive a full refund less a $25 cancellation fee if the spot can be filled from the waiting list. If the spot cannot be filled, the amount refundable is 80% of the workshop price. Paid registrants who cancel after March 15, 2016 will receive a full refund less a $50 cancellation fee if the spot can be filled from the waiting list. If the spot cannot be filled, no refund will be given.